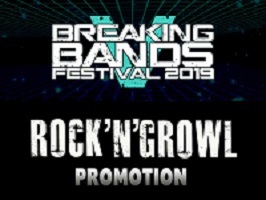 Breaking Bands Festival have announced their new partnership with promotion/publicity company Rock ’n’ Growl Promotion. Both sides have known each other professionally for a number of years. Axel Wiesenauer added:“We are very pleased to be working with Jay and the Festival. Breaking Bands Festival takes place 23 – 26 May at Stoke Prior Sports and Country club.